It’s that time of year again. You may have noticed that your eyes are watery, red, and itchy, especially when you go outside. These are all symptoms of springtime eye allergies, which can cause considerable discomfort. At Monterey County Eye Associates, Dr. Eric J. Del Piero, Dr. Leland H. Rosenblum, and Dr. Theresa de Barros offer a range of eye care services to improve your eye health and visual acuity. We can help you find the right vision treatment if you suffer from eye allergies. In this post, we discuss how eye allergies affect our patients. Read on to learn more, and then contact our Monterey, CA practice to schedule your next eye appointment with us. Eye allergies cause a number of unpleasant symptoms. Unfortunately, when patients give in to the intense urge to itch or rub the eyes, the eyes become red and puffy, and they also increase the risk of developing a serious eye condition. Eye allergies can cause the whites of the eyes to turn red; when patients rub the eyes, it can worsen this symptom. No one wants to go to work or social functions with red eyes. To alleviate this symptom, try not to touch the eyes, take allergy medication, and use eye drops. Itching the eyes can cause the skin surrounding the eyes to swell up. This can result in under eye circles and puffy bags under the eyes. To reduce this symptom, try not to touch the eyes, take allergy medication, and apply a cool compress to the eyes. In addition to these aesthetic concerns, touching the eyes increases the risk of developing an eye infection. In general, patients should avoid touching their eyes unless their hands are clean. Otherwise, you can transfer bacterial and viral infections to the eyes. 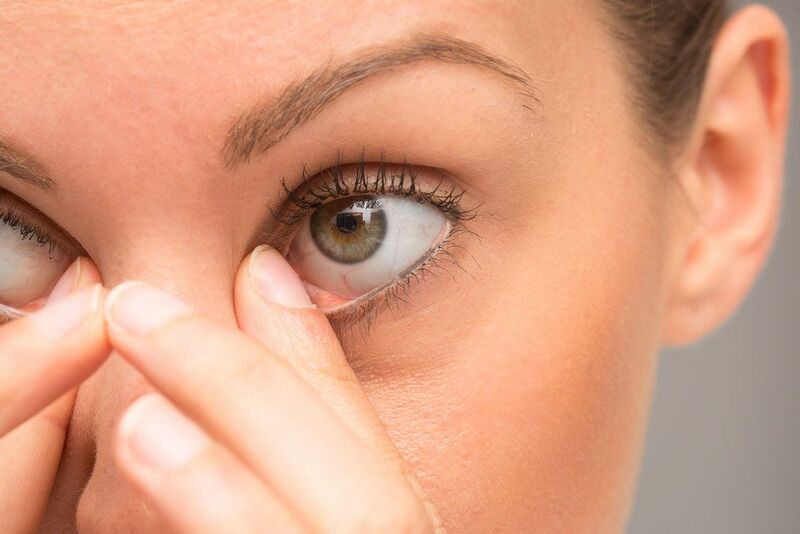 Aggressively rubbing the eyes can cause corneal damage. The cornea is the clear, protective covering of the eye. It can become scratched, which causes significant discomfort. Corneal injuries can be treated with eye drops and the use of an eye patch. Contact lenses are an excellent way to improve vision. However, it can be difficult to put them in or uncomfortable to wear them, especially if you suffer from eye allergies. Many patients find that they can’t wear their contact lenses at all during eye allergy season. In these cases, patients will have to wear their glasses. Alternatively, patients can undergo eye surgery to permanently improve vision. If you wish to undergo eye surgery such as LASIK to reduce your dependency on contacts and glasses, it is important to consider timing. Patients cannot touch or itch the eyes during recovery from eye surgery. Due to this reason, you should avoid surgery during allergy season. Schedule your surgical procedure for a time in which you don’t have red, watery, and itchy eyes. To schedule an appointment with us, contact Monterey County Eye Associates today.